After years of tension, the Orcs, Dwarves, Elves, and Hobgoblins are finally at war. The year will be full of conflict and battle. This is great news to you. You’re an arms merchant. And business is about to boom. Battle Merchants is an economic strategy game where four fantasy races fight in a fantasy world. As a player, you take the role of a weapons dealer, forging and selling weapons to the participants. You don’t have any allegiance to a single race, though the more you sell to someone, the more money they will give you. The race that wins the game is irrelevant. The richest player at the end of the game wins. 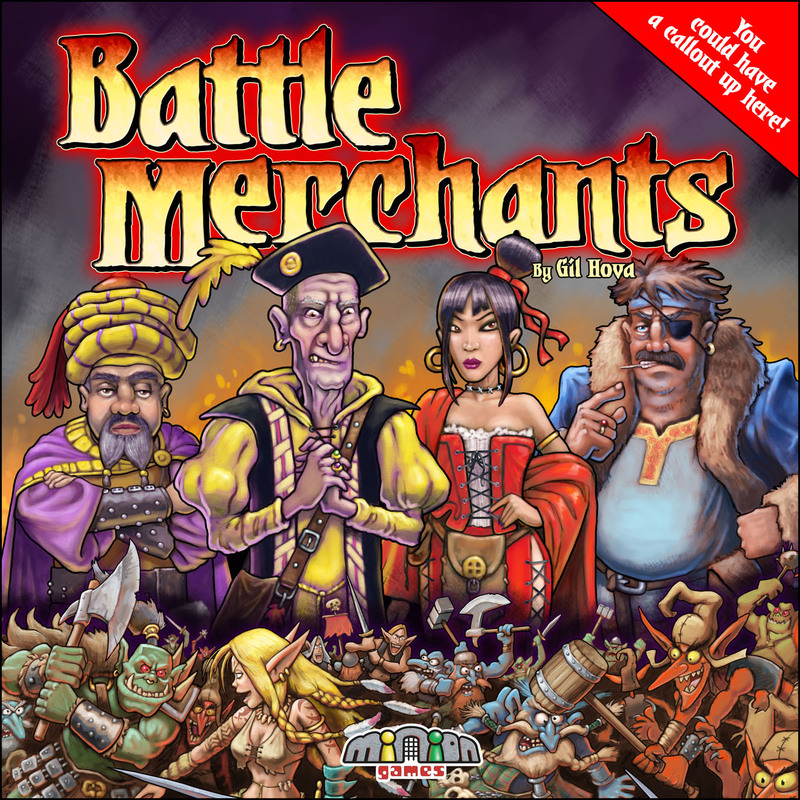 Battle Merchants was released by Minion Games in July 2014. Buy the game from Minion Games here. Download the official Kingdom Card almanac here. This game is FANTASTIC. While at first the rules may seem a little overwhelming, you quickly realize that it’s really relatively simple and it plays very fast after the first game. I’ve played this 6-7 times with a slew of people and I haven’t played it the same way twice, nor had anyone not like it. The balance is perfect. You know those games where it says 3-4 players, but it’s really only fun with 4? This plays great with 3 and it plays great with 4. I’ve really got to hand it to the creator, Gil Hova, whom I had the pleasure of meeting and talking to at length when I bought this at PAX South; this thing is really, really well thought out and it has fantastic replay value. The Artwork is great. It’s a game that takes just enough goofiness to spark some smiles in an economic/euro game. I enjoyed setting aside the A-Kingdom Cards after I played a couple times. Before I tried that, we hadn’t ever get down into some of the really good ones and I think it’s a great way to spice it up.